Selected through a competitive application process, Writing Fellows are chosen for their proven performance as writers and for their strong interest in helping others improve their writing. UW—Madison’s Writing Fellows represent a wide range of majors, including sociology, political science, English, philosophy, molecular biology, physics, and history. All new Writing Fellows enroll in English 403, a three-credit honors seminar on tutoring writing across the curriculum taught by the program’s associate director, Emily Hall. In the course, Fellows study writing in both practical and theoretical terms—as a way of thinking, a means of communicating with others, and a practice that varies across disciplines and across social and cultural conditions. The course is offered in the fall semester. 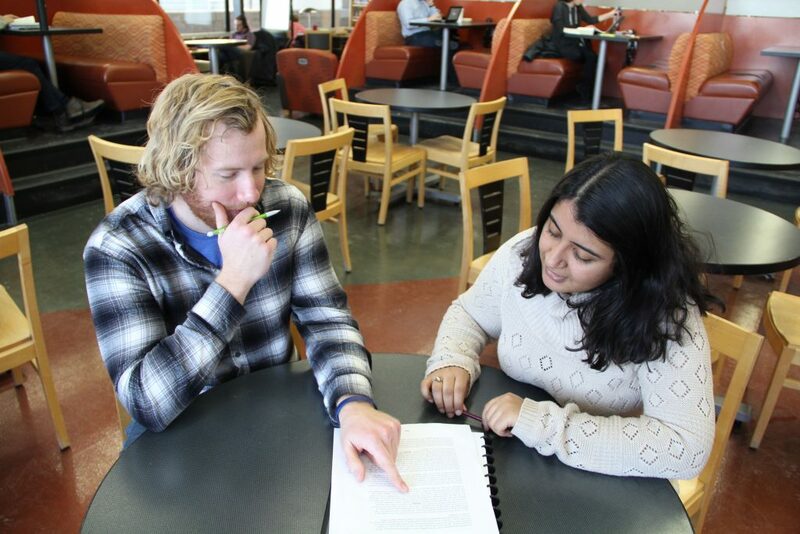 Under the guidance of participating faculty, each Writing Fellow works closely with 10 to 15 students enrolled in a writing-intensive or Communication-B course. Fellows are assigned to courses in a variety of disciplines including history, languages and cultures of Asia, Afro-American studies, English, sociology, political science, physics, gender and women’s studies, and many more. In these courses, Fellows make written comments on drafts of assigned papers and hold conferences with students to brainstorm ideas for revision. Students then revise their papers before submitting them to the course professor for a grade. For their service as tutors, Fellows receive an honorarium of ~$1000 per semester. Students who work with Fellows receive detailed feedback on their writing assignments before they are graded, thus allowing them not only to improve those papers, but to become better writers overall. Professors who use Fellows in their courses receive better, more thoughtful, and more polished papers. Fellows themselves hone their own skills as writers, critical readers, and educators and gain exposure to writing from a wide variety of academic disciplines. They take on important leadership roles as they participate in the teaching mission of UW—Madison. At the same time, they join a diverse community of students committed to integrating intellectual inquiry with service to the University. Applicants must have at least two semesters remaining at UW—Madison to be eligible to apply and must be in the current first-year, sophomore, or junior class. Applicants must submit two samples of their writing, a transcript, a letter of recommendation, and a personal statement. We look for successful, enthusiastic writers from a variety of fields. Personal interaction is at the heart of this program: Fellows have to be both careful listeners and quick thinkers. Fellows must be mature, responsible individuals who are able to work independently, meet deadlines, and who are willing to adapt their schedules to accommodate the demands of tutoring. Applications are due in early March. Applications are available at Scholarships@UW-Madison.